If you were a big fan of Rudyard Kipling’s ‘The Jungle Book’ as a kid and want to trace the source of its inspiration, you might want to visit the Kanha National Park. This is one of the most popular national park in Madhya Pradesh (central Indian state). The national park is also a part of the Project Tiger and was declared as a tiger reserve in 1974. Apart from the tigers the forests of Kanha National Park are home to several species of flora and fauna. The regions were once ruled by the Elephants before it was declared a reserve forest. It is comprised of two separate protected areas known as Hallon and Banjar wildlife sanctuaries. The terrain mostly comprises of grasslands and tropical moist deciduous forests and has bamboo on slopes. The grassy meadows have replaced the older villages which have been resettled to make more room for the animals. The grass is instrumental for the survival of several grazing and herbivore species found in Kanha. The summers start in the month of March and continue till July. The temperatures are extremely high during the summers and usually range between 30 to 46 degrees Celsius in the peak of summers. The monsoon season in Kanha National Park is moderate and the average annual rainfall is 152 cm. 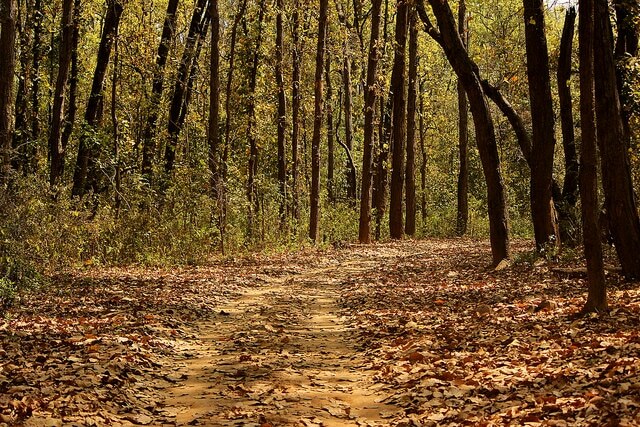 winters arrive in mid December in Kanha and the temperatures plummets below 10 degrees Celsius. The months of December, January and February are the winter months with a mild weather. The summer months are usually avoided by visitors due to the extreme heat and drying up of most water sources. Animal activity is also less during the summers and most animals come out during the night. The rainy season is best for people who want to catch the reptiles of Kanha in action. The months from October till February are the best for visiting as the climate is the mildest and the animal activity is the highest. Kanha National Park is one of the major strongholds of the Bengal Tiger and the Barahsingha. The grass in the region supports several herbivore species which in turn support the existence of the various predator populations in the region. Animals – Tigers, Leopards, Wild Dogs, Wild Cats, Jackals, Swamp Deer, Barahsingha, Indian Bison, Foxes, Spotted Deer, Sambhar deer, Barking Deer, Mouse Deer, 4-horned deer, Nilgai, Sloth Bear, Hyena, Porcupine, Honey Badgers and Hares etc. Reptiles – Cobras, Kraits, Rat Snakes, Pythons, Vipers, Grass Snakes, Keelbacks and few species of Turtles and amphibians can be found near the ponds and rivers. Nearest Airport – Jabalpur is the nearest airport to Kanha National Park. The neighboring airports at Nagpur and Jabalpur are also well connected from other major airports in the country. Nearest Railway Station – Jabalpur again is the best place for you to reach Kanha National Park, it is the nearest railway station and is well connected via trains from all major railway stations in India. Road Accessibility – One can reach Kanha Wildlife sanctuary by road through Jabalpur and Mandla. Buses and taxis are readily from Indore, Jabalpur and Bhopal. There are several budget and mid-ranged lodging facilities near Kanha but one must make early reservations as bookings can get full during tourist season. The various resorts located in Kanha also have their private entry into the jungle area and offer their own safaris. Entry Fees can be quite handsome at Kanha National Park as compared to other wildlife reserves in India. Rs 1,850 for Premium Zone, Rs 1,250 of Non-Premium Zone are the basic prices for Indian citizens and the amounts double for the foreigner tourists. Jeeps cost Rs 1,800 with a maximum of 6 persons per jeep and an additional guide fee of Rs 300. Student group can receive special permits that allow them a 50% discount.